Right-hand turn bicycle accident claims are, unfortunately, an all too common occurrence in my experience in providing legal representation for cyclists. An increasing number of people in Los Angeles and throughout California are choosing to ride bicycles as a primary mode of transportation to their jobs. The League of American Bicyclists reports that nearly 1 million Americans are using their bicycles to commute. Between 2000 and 2013, the percentage of people who chose to ride bicycles to commute increased by 105 percent. According to the U.S. Census Bureau, several large cities in California are leading the way for bicycle commuting. While choosing to commute by bicycle is healthier for the cyclists and for the environment, the riders are much likelier to suffer serious injuries if they are involved in collisions. Bicyclists have the same rights and responsibilities when they are operating their cycles on the roads as do other motorists. Among the most common types of accidents, collisions involving motorists turning right are especially dangerous. Some officers and other motorists fail to understand that bicyclists do have the right to take the lane when one of these exceptions apply. An experienced personal injury lawyer in Los Angeles may help you if you have been injured and have had fault wrongly attributed to you by the officer for taking the lane under one of these circumstances. Under California Vehicle Code § 21650, bicyclists are supposed to ride in the same direction of travel as other motorists. Finally, if there is a bicycle lane available, bicyclists must use it unless they are turning left, trying to avoid hazards, passing other cyclists or approaching an area where right turns are allowed. While bicycle accidents may be caused by a number of different factors, some of the most frequently occurring involve right-hand turns by motorists. There are three types of right-hand turn accidents that are especially dangerous and that bicyclists and motorists should take care to avoid. In this scenario, a vehicle is waiting at a red light when a cyclist stops to the motorist’s right. When the light turns green, the motorist turns right, colliding into the bicyclist. Cyclists may avoid this type of accident by staying out of the blind spots of the motorists. They may stop slightly ahead of the stopped vehicle or directly behind it. They should be especially cautious about stopping at a red light to the right of a large bus or truck because of the difficulty these drivers have of seeing around the large vehicles. 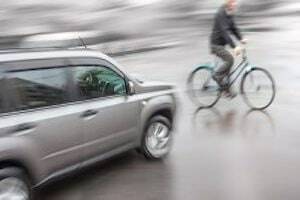 Bicyclists should not move past the vehicle when the light turns green because some drivers fail to use their right turn signals and might turn unexpectedly. Another common right-hand accident scenario involves a car that is traveling faster than a cyclist near an intersection. The vehicle then suddenly turns right across the cyclist’s path, causing the cyclist to collide into the side of the vehicle. In order to avoid this type of collision, bicyclists can take the lane so that they are more visible when they are approaching intersections where right turns are allowed. They should also avoid riding on sidewalks before crossing the streets because doing so might make them invisible to drivers who are turning right. Before getting to the intersection, bicyclists should glance in their handlebar mirrors so that they can see the vehicles that are approaching them. Another common type of right-hand bicycle collision involves cyclists who are passing slow-moving vehicles or other cyclists on the right when they are approaching areas where right-hand turns are allowed. The cars then suddenly turn right, colliding with the cyclists. You can avoid this type of collision by not passing cars or cyclists on the right. Instead, take the lane and pass the slower vehicles on the left. If a driver committed a traffic violation which caused the driver to have a right-hand collision with a bicyclist, the violation may be used to show that the driver was negligent per se. In order to prove negligence, cyclists must show that the driver owed a duty of care to them and that the driver violated the duty that he or she owed. The cyclist must then show that the breach of duty was the direct or proximate cause of the accident, that the cyclist was injured and suffered financial harm. An experienced Los Angeles personal injury attorney may help you to gather evidence that proves liability in an effort to strengthen your claim. If you have suffered serious injuries or your loved one was killed in a right-hand bicycle accident, you might have legal rights. Contact an experienced Los Angeles bicycle accident lawyer to schedule your free consultation today. Toll Free: 866-966-5240.